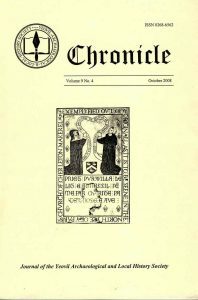 Twenty-four years ago Muriel Searle (then Muriel Gittos) wrote the first part of a history of the Quakers in Yeovil (Chronicle, vol.2 no.6, April 1984, p.87). She concluded with the promise `In my next article I will tell you how the Friends’ Meeting House came to be built in Kingston.’. After a gap of nearly a quarter of a century, Part 2 appears here! Muriel Searle has provided the text of a letter published in the Western Gazette in March 1930, which was written anonymously, under the nom de plume `Ivel. It gives a fascinating account of the letter writer’s own reminiscences of the Quaker chapel in (Lower) Kingston, which had been demolished some fifty years previously. 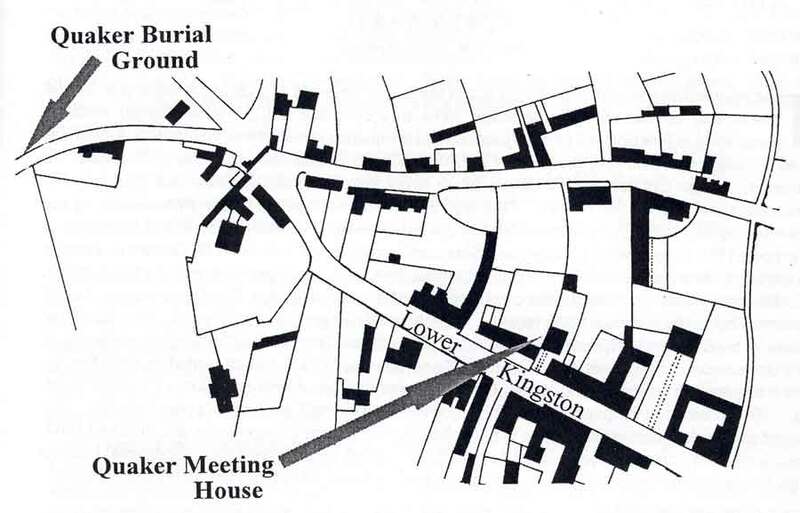 The accompanying sketch map shows the location of the Meeting House and is basesd on Leslie Brooke’s redrawing of Watts’ map of 1831. In view of the letters published in the “Western Gazette” re the past existence of Quakers and their meeting place in Yeovil, probably the following brief recollections of 50 years ago by an old fogey may prove of interest to those correspondents seeking information. 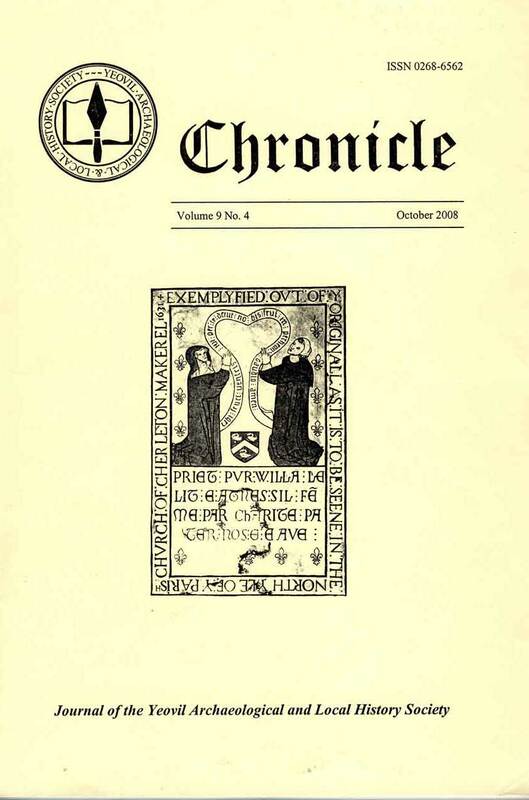 Up to a half a century ago it is recorded that the Quakers met for worship locally. The first chapel is dated from 1690, and was built in Kingston. 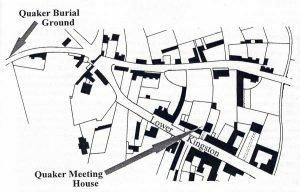 Evidently meetings were held previous to this date, probably in some Quaker’s house, before the erection of the meeting house, as a stone in the wall of the Friends’ burial ground in Preston-road records the fact that in 1669, provision was made for the burial of members of their sect. Half a century ago, as I remember it the chapel was situated in Kingston, opposite York Place, on a site now forming a drive and lawn to Mr Moore’s house in Higher Kingston. Judging by its style and condition, at that time one is led to form the opinion that it was the original building erected in 1690. It was a small square building of rough Hamstone, with a thatched roof. The exterior was partially covered with ivy and jasmine presenting the appearance of an old-fashioned country cottage. The windows, two in number, were in the frontage of the building, set a little lower than the roof. This interesting feature of their position suggests that it was for the purpose of preventing curiously-minded persons from witnessing their simple devotions. The interior of the chapel was plain and bare of any artistic decoration. The walls were whitewashed, the pews high-backed and cushionless. Writing from memory, 50 persons would have severely taxed the seating accommodation provided for the congregation. The building stood about 15 yards from the public pathway, enclosed by iron gates similar to those in existence at the present time. The present writer vividly remembers his first and only attendance at one of the services. My aunt, was at this time, caretaker and cleaner of the chapel; my cousin and I used to relieve her of the Sunday morning dusting the pews. One Sunday morning curiosity prompted me as a youngster, to witness the conduct of the service. The congregation consisted of about eight persons. After a long silence, the Spirit moved a sailor, who was present, to engage in prayer. After this long lapse of time, I can still visualize the “quarter-deck” shouting and “sawing the air”. His vehemence of speech created a state of fright to my young mind. At the rear of the chapel was a paint shop and stores used by Mr. C. Foot, who, I believe, still lives in Kingston. The caretaker’s lodge, a low thatched cottage, stood inside the gates on the right-hand side of the path leading to the meeting-house. Adjoining this were several small cottages facing the old White Lion Inn. These also had thatched roofs. The small front gardens were enclosed within wooden railings. At present, four brick houses occupy the original site of the cottages. If my memory serves me correctly, the chapel and cottages were pulled down in 1879. I have also a recollection of seeing the last burial take place in the Friends’ burial ground. I believe it was Mr. W. Hannam, a leader of the Quakers in those days, who found a last resting place there in or about the year 1879. He was a partner with a Mr. Gillett, carrying on the ironmongery business in High-street, now in the occupation of Messrs. Hill & Sawtell. Many years ago there lived in or near Martock a Quaker, named Dr. Fox who claimed to be a lineal descendant of George Fox, the founder of the sect. He habitually wore the typical dress adopted by his namesake. He was often to be seen in Yeovil, his garb being a great source of attraction. The last time I remember seeing him was about thirty-two years ago, when he took part in an anti-vaccination meeting held in the Town Hall. The illustration on the cover of a well-known food advertisement will convey to the mind of the younger generation the quaint dress worn by Dr Fox.